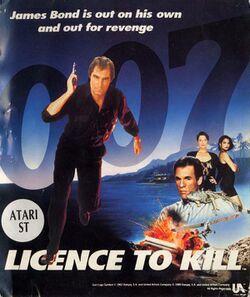 007: Licence to Kill is a 1989 video game based on the James Bond film of the same name, developed by Quixel and published by Domark in 1989. It was originally released for DOS and then ported to the Amiga, Amstrad CPC, Atari ST, Commodore 64, MSX and ZX Spectrum. The game's storyline closely follows that of the film, and consists of six scenes in which Bond chases Sanchez, who has murdered Felix Leiter's bride. The scenes within the game vary, and include helicopters, on foot, mid-air, underwater, water-skis and behind the wheels of a tanker truck. This page was last edited on 13 June 2013, at 03:16. This page has been accessed 7,617 times.